Preheat oven to 350 degrees F. Completely line one 12-cup muffin pan with foil cupcake liners and two cups of a second 12-cup muffin pan. Set aside. In a large bowl sift together the flour, baking powder, baking soda, salt, cinnamon, nutmeg and cloves. Set aside. Whisk together the brown sugar and eggs until combined. Add the pumpkin, milk, vegetable oil and vanilla and stir until combined. Stir the wet ingredients into the dry ingredients until just combined, making sure not to over-mix. Evenly spoon the batter into the lined cups. Bake for 18 minutes, or until a toothpick inserted into the center of a cupcake comes out clean. Let cool completely on a wire rack until frosting. Beat the cream cheese and the butter in the bowl of an electric mixer on medium-high speed until fluffy, about 2-3 minutes. Add the powdered sugar and beat on low speed until combined. Increase the speed to medium-high and beat for another 2-3 minutes. In a large saucepan melt the butter over medium heat. Add the sugar and cook until the sugar is a rich golden brown, making sure to stir often. Remove from the heat and whisk in half of the cream. Be careful as the mixture may splatter. Once combined stir in the rest of the cream, the vanilla and the salt. If any lumps form slowly whisk the caramel sauce over low heat. Spread the cream cheese frosting on the cupcakes, slightly mounding the frosting. Create a well in the center of the frosting with a small spoon. Place 1 Starburst at an angle in the well. 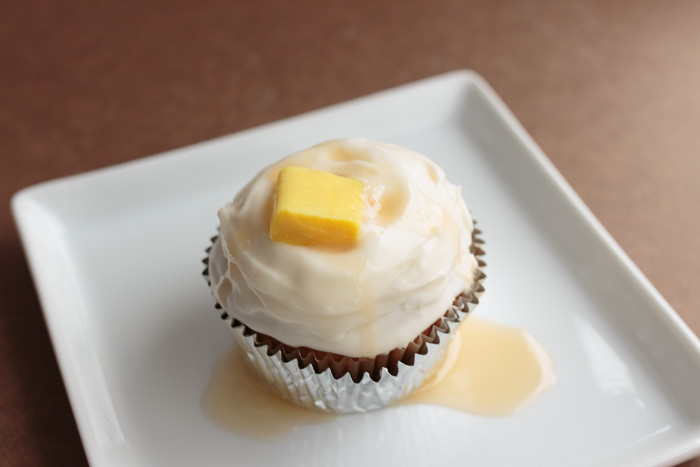 Drizzle warm caramel into the frosting well until it fills up and spills over like gravy. Leftover caramel sauce can be kept in the fridge for 2 weeks and reheated slowly in the microwave or in a saucepan over low heat.